For Lil's b-day, she decided she wanted to try Typhoon, a Southeast Asian-inspired restaurant. In particular, she wanted to try one of their insect dishes. That's right. INSECT dishes. And Dubya just jumped at the idea. Why, I'm not sure. Anyway, when we got to the restaurant, there were four options: water bugs (stuffed with chicken), stir-fried crickets, ants sprinkled on potato chips, and fried worms. When Lil asked if there was anything we felt like (as if I ever "feel like" having any of those things), I drew the line. "No worms. You can order insects, but NO WORMS." They ordered the water bugs...which, as we were later informed...they were out of! How do you run out of water bugs? Is it that popular? 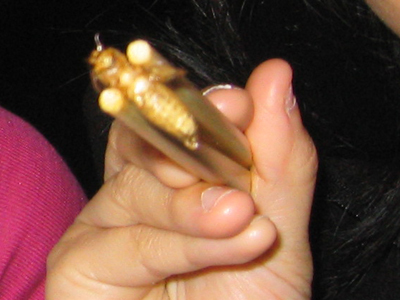 So, our second choice was the stir-fried cricket. I could only ingest three before my mind lost the "don't think about what it is" battle. They were crunchy. I will probably never eat cricket again. 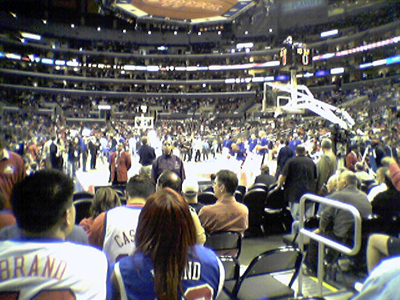 This past Monday, P$'s friend Lester, who works for the Clippers, scored these awesome seats at Game 2 of the playoffs. I was maybe six rows from the floor. I could see Elton Brand's individual teeth, I was so close. It was so much fun! The crowd was totally pumped up, the Clippers dominated the Nuggets, and I was close enough to chuck my soda cup and have it actually hit Jay Mohr, not that I have anything against him. With my aim though, I probably would have ended up hitting Nikki Cox next to him. The Mile That Felt Like Five. I am soooo out of shape. I went hiking today at Mt. Wilson with my dad. I was huffing and puffing and pretty certain that we were about to summit because it felt like we had been walking forever...and then I saw the sign for First Water, which is the first stop on the trail and 1.3 miles away from the start of the trail. I felt so pathetic, and someone who could have been my grandfather ran past me on the way up and then sped past me again on the way down. Oh yes, Jaime opened up his own chiropractor clinic in SF. Congratulations! Wendiva and I went to the grand opening, but had to walk an extra couple of blocks because we missed our stop. And we missed our stop because we couldn't figure out how to get off the damn MUNI. The sign that tells you how to open the door is not placed at eye level, which I blame entirely for our mishap. So there we were, pounding on the MUNI door, saying, "Open! ", and all the while native San Franciscans on the MUNI just sat there, silently watching us. And silently laughing at us, I'm sure. Oh, and I also got to see Lionel Richie in concert. For free! It was awesome. "Hello," "Brickhouse," "Easy," "Say You, Say Me," "All Night Long," "Penny Lover," and "Dancing on the Ceiling" were just a FEW of the great songs he performed. Tons of fun. All this hiking has tired me out. I need to shower. And fill my tummy.